Mourning the loss of the Kryptonians wiped out by Rogol Zaar, Supergirl decides to play detective and sets off into deep space to learn more about the would-be usurper. Come aboard this new status quo for Kara Zor-El, as the dust settles from Brian Michael Bendis' Man of Steel graphic novel in Supergirl Vol. 1! Superman and Supergirl, the last two Kryptonians on Earth, have had their beliefs shattered. 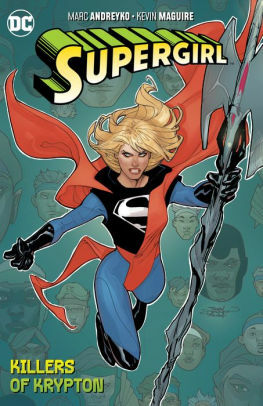 With new revelations about their home planet--and the man who destroyed it--Supergirl builds a star cruiser using whatever tech she can scrounge, and after intel from Green Lantern, she blasts off into the cosmos with Rogol Zaar's deadly axe to solve the mystery--along with a traveling companion you won't believe! With Supergirl's status quo completely turned upside down, Supergirl Vol. 1 is an all-new jumping-on point for any reader interested in the titular character behind one of The CW's highest-rated shows! Master comics author and screenwriter Marc Andreyko and legendary illustrator Kevin Maguire comes on board to pen a story featuring one of the strongest of DC's characters, Supergirl! Collects #21-26.